With the Dow Jones Industrial Average approaching and now breaking the 16,000 level, there has been a lot of discussion about whether the stock market is an inflating bubble about to burst due to excessive price appreciation? 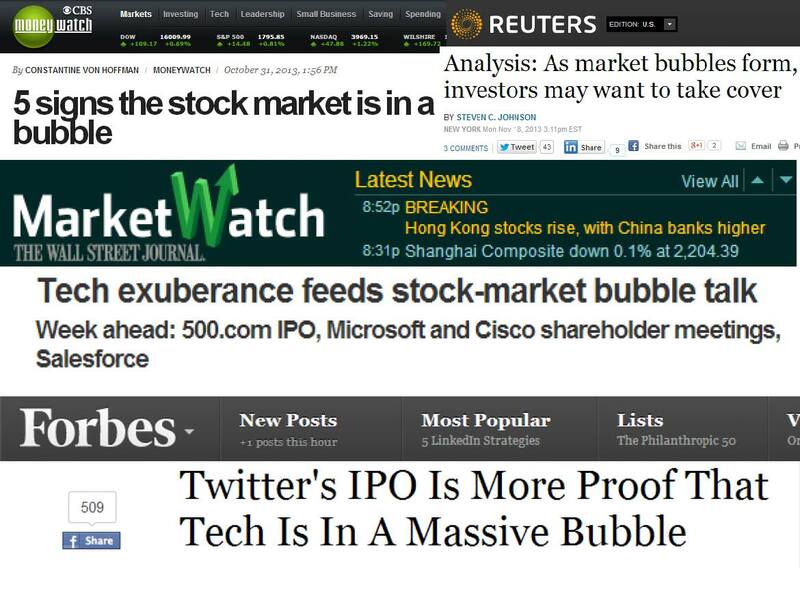 The reality is a fear bubble exists…not a valuation bubble. This fear phenomenon became abundantly clear from 2008 – 2012 when $100s of billions flowed out of stocks into bonds and trillions in cash got stuffed under the mattress earning near 0% (seeTake Me Out to the Stock Game). The tide has modestly turned in 2013 but as I’ve written over the last six months, investor skepticism has reigned supreme (seeMost Hated Bull Market Ever & Investors Snore). If you think identifying financial bubbles is easy, then you should buy former Federal Reserve Chairman Alan Greenspan a drink and ask him how easy it is? During his chairmanship in late-1996, he successfully managed to identify the existence of an expanding technology bubble when he delivered his infamous “irrational exuberance” speech. The only problem was he failed miserably on his timing. From the timing of his alarming speech to the ultimate pricking of the bubble in 2000, the NASDAQ index proceeded to more than triple in value (from about 1,300 to over 5,000). If the most powerful people in finance are horrible at timing financial market bubbles, then perhaps you shouldn’t stake your life’s savings on that endeavor either. • Dutch Tulip-Mania: About 400 years ago in the 1630s, rather than buying a new house, Dutch natives were paying over $60,000 for tulip bulbs. • British Railroad Mania: The overbuilding of railways in Britain during the 1840s. • Roaring 20s: Preceding the Wall Street Crash of 1929 (-90% plunge in the Dow Jones Industrial average) and Great Depression, the U.S. economy experienced an extraordinary boom during the 1920s. • Nifty Fifty: During the early 1970s, investors and traders piled into a set of glamour stocks or “Blue Chips” that eventually came crashing down about -90%. • Japan’s Nikkei: The value of the Nikkei index increased over 450% in the eight years leading up to the peak of 38,957 in December 1989. Today, almost 25 years later, the index stands at about 15,382. • Tech Bubble: Near the peak of the technology bubble in 2000, stocks like JDS Uniphase Corp (JDSU) and Yahoo! Inc (YHOO) traded for over 600x’s earnings. Needless to say, things ended pretty badly once the bubble burst. 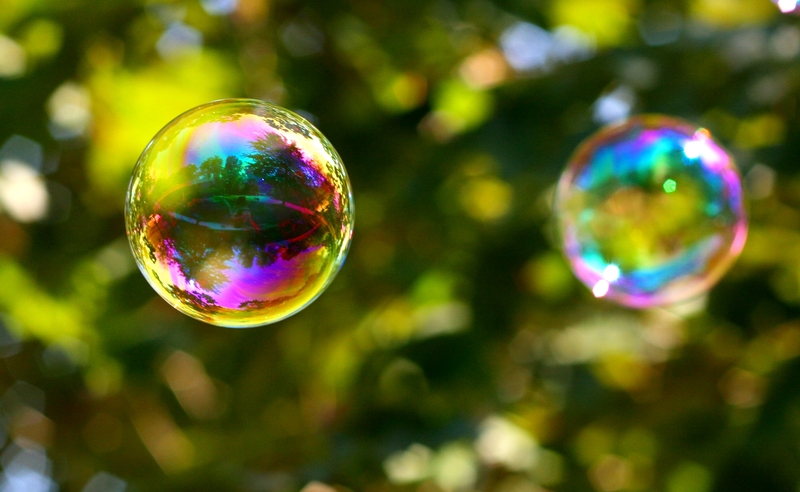 As long as humans breathe, and fear and greed exist (i.e., forever), then we will continue to encounter bubbles. 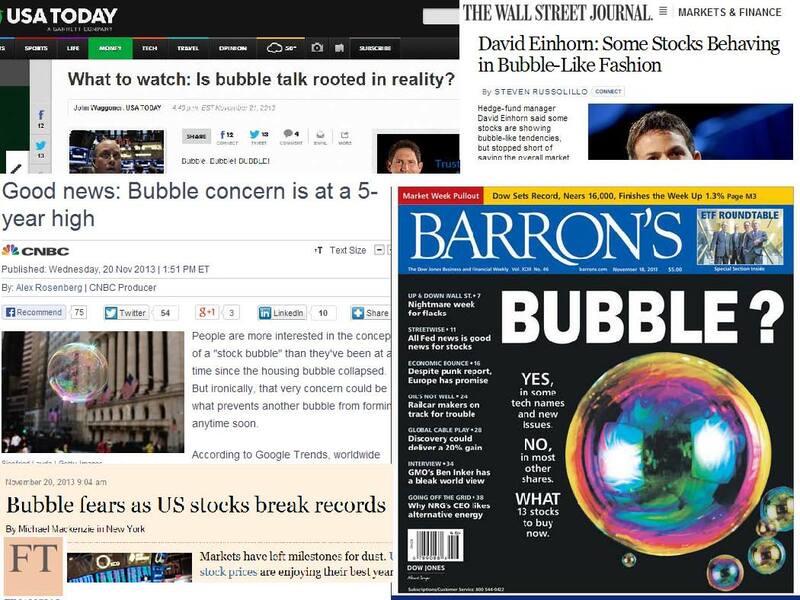 Unfortunately, we are unlikely to be notified of future bubbles in mainstream headlines. The objective way to unearth true economic bubbles is by focusing on excessive valuations. While stock prices are nowhere near the towering valuations of the technology and Japanese bubbles of the late 20th century, the bubble of fear originating from the 2008-2009 financial crisis has pushed many long-term bond prices to ridiculously high levels. As a result, these and other bonds are particularly vulnerable to spikes in interest rates (seeConfessions of a Bond Hater). Rather than chasing bubbles and nervously fretting over sensationalistic headlines, you will be better served by devoting your attention to the creation of a globally diversified investment portfolio. Own a portfolio that integrates a wide range of asset classes, and steers clear of popularly overpriced investments that the masses are talking about. When fear disappears and everyone is clamoring to buy stocks, you can be confident the stock bubble is ready to burst. DISCLOSURE: Sidoxia Capital Management (SCM) and some of its clients hold positions in certain exchange traded funds (ETFs), but at the time of publishing SCM had no direct position in TWTR, JDSU, YHOO or any other security referenced in this article. No information accessed through the Investing Caffeine (IC) website constitutes investment, financial, legal, tax or other advice nor is to be relied on in making an investment or other decision. Please read disclosure language on IC Contact page.